"In marriage, we are most looking forward to having each other and being a family." In the gorgeous summer afternoon light, Karl Cristie and Joe vowed to continue loving, traveling, and supporting each other. They promised that no day is perfect without each other by their side, and that wherever they go, their pups will follow. From the struggles of long distance, their love for each other paid off. And the reward was marriage. They won their hardest battle; only adventure is left to come. I arrived to Opal 28, one of my favorite Portland urban venues, to string lights and plenty of greenery. Joe was putting the finishing touches on their alter, and Karl Cristie was laughing with her friends upstairs. It was clear that today would be all smiles. One of the more special moments for the couple was their first look. Karl Cristie joked that this would be practice for when she actually walked down the isle. Joe's face said it all, he couldn't wait to get to hold his brides hand for a lifetime. 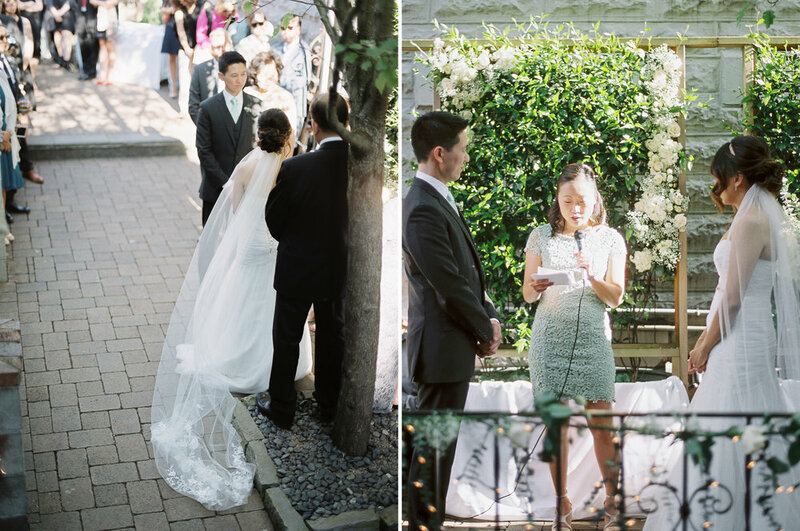 Their metallic details added elegance to the urban outdoor space. 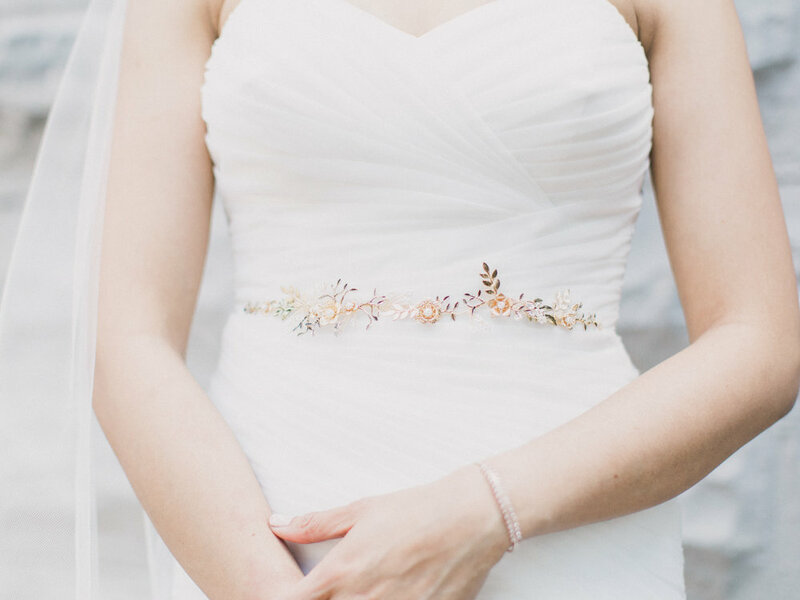 Karl Cristie wore simple and stunning rose gold jewelry to compliment her mermaid-fashioned wedding dress without taking away too much attention. 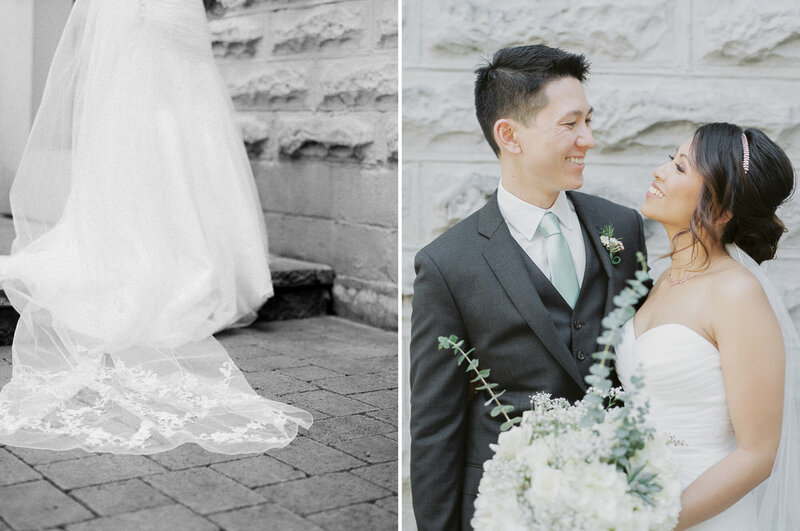 Her simple cathedral veil tied her wedding look together in a classic, but modern touch. The floral details at the end gave me big heart eyes! One of my favorite personal touches they added to the wedding was Karl Cristie's very own bouquet. She said making her own flowers was one of the highlights of her day, as she felt it was more personal to her, as well as a real challenge! The eucalyptus and hydrangeas were the highlight, but I personally loved the small succulent she tied into the piece without making it feel forced or overwhelming. But, of course, how could KC and Joe have their wedding without their pups along for the ride? 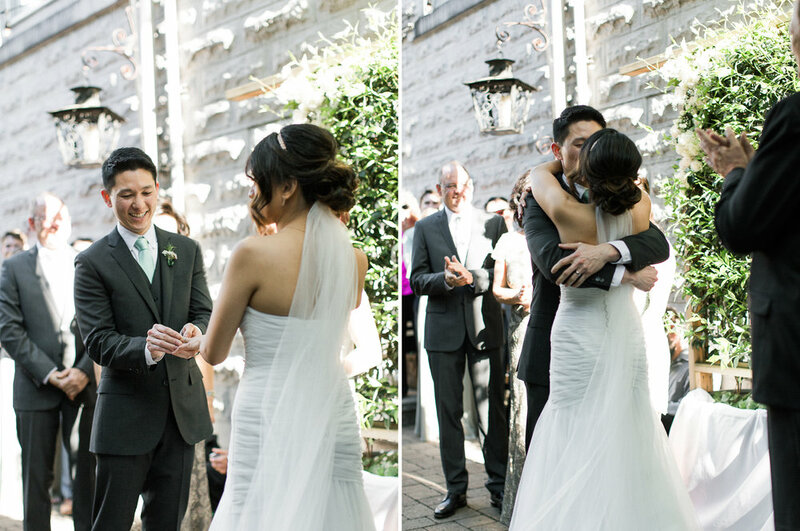 By the end of the ceremony, their cheeks were hurting from their big grins. The happiest day of their lives was finally here. And by their side, their most beloved friends and family. Some of which flew overseas to be a part of. Following the ceremony, the guests mingled with each other, specialty cocktails in hand. 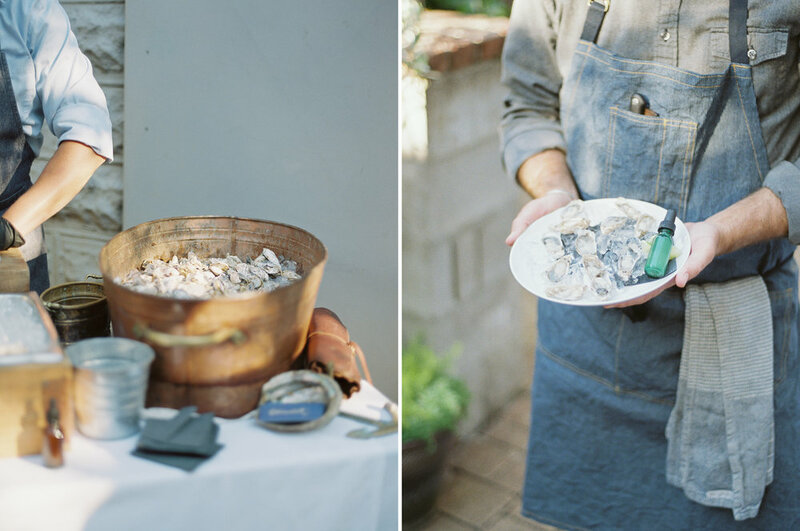 One of the more unique aspects of this urban wedding was that dinner was comprised of continuous plates, versus a buffet or plated dinner. Opal 28 and Grind Musubi did a fantastic job catering with coastal inspired plates such as salmon cream cheese crostini bites, hand rolls, and crab cakes. My personal favorite dish was the local artisan oyster bar by Tournant. Freshly shucked and served with lime! The part I look forward to most at a wedding, is the quiet few minutes the couple gets to take following dinner. Away from the crowd, away from the action. I like to try and allow the moment of marriage to sink in before jumping into photos. It delivers a more authentic emotion, and the couple doesn't have to worry about cameras constantly in their faces. I mean, look at this love! The adventure was not over at the end of the night, however. Because KC and Joe are not from Oregon, one of their biggest requests was to hold a day after/trash the dress session on the gorge, preferably with a waterfall. So, the next day, we found ourselves at LaTourell Falls at 7am. Asides from the crashing waterfall, the air around us was silent. It was the perfect place they could have imagined being married. And they knew this was only the beginning. Right before we all drove back to Portland, I suggested taking a stop at Vista House to warm up and dry off in the rising sun. What I didn't expect was a special moment between the newly weds, who quite honestly did not want to stop looking at each other. You could see it in their eyes: the love, the happiness, and the wonder. This was only their first stop on a lifelong journey together.